Invite your peeps and hop on over to Sundial St. Pete for their Easter Eggstravaganza on Saturday, April 20th! Sundial St. Pete will be hosting egg-citing activities and entertainment for all ages. Start the day bright and early with FREE yoga presented by The Body Electric Yoga Company in the Sundial courtyard from 9-10 a.m. Yoga is for every bunny – all shapes, skill levels, sizes and ages! Stay after class for a tasting hosted by Mother Kombucha, a local business who brews and kegs their kombucha in St. Pete. Hop back to Sundial Saturday afternoon from 1-4 p.m. to continue the celebrations with Sundial’s Easter Eggstravaganza. 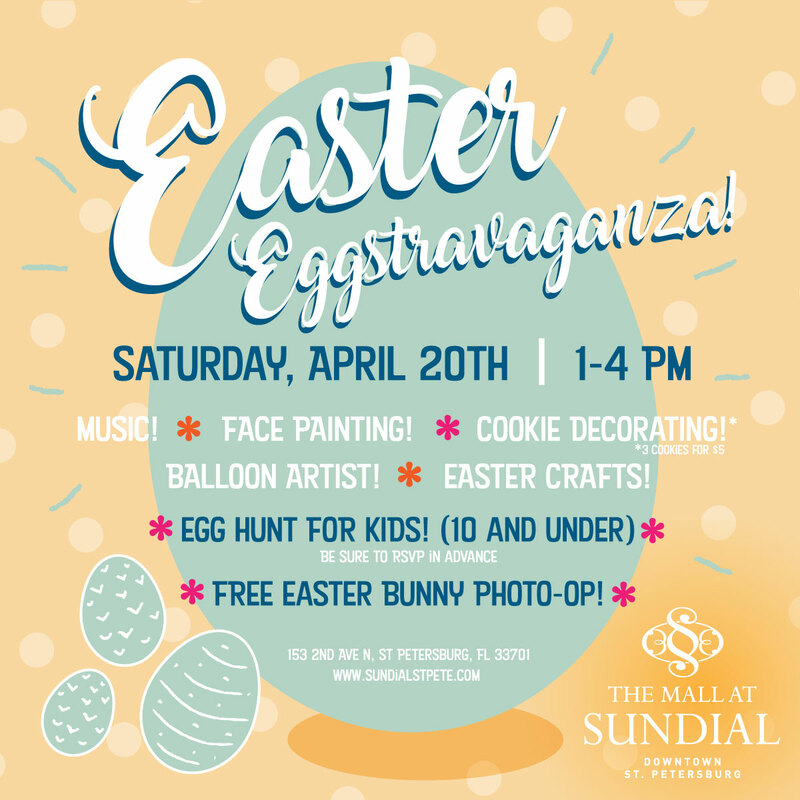 They’ll have lots of hop-penings for the kids: music, face painting, a balloon artist, bunny crafts hosted by the Sundial Gift Shoppe and free photo-ops with the Easter Bunny himself. Locale Market will also be hosting Easter cookie decorating ($5 for 3 cookies). Plus, for the first time ever, Sundial will be transforming their breezeway into a magical field with eggs galore! Bring your own Easter basket and register the kids (10 and under) in advance to participate in the egg hunt. Register for the egg hunt here.